Produced by Gris Gris Films, Maangamizi - The Ancient One was the first creative feature project under the company's banner and brought together an international cast and crew. The creation of the film was the result of the collaborative vision of the filmmaking team of Ron Mulvihill and Martin Mhando, (producers/directors); Queenae Taylor Mulvihill (producer/screenwriter); and Cyril Neville (composer/musician). Additionally, the support of Jonathan Demme as Executive Producer was essential. This unique story unites three distinctive cultures (American, African-American and African) which forms a drama strking in its universality. Formed in 1994, Gris Gris Films is an independent production company dedicated to producing films whose subject matter and message tap the highest aspiration of the creative impulse. Gris Gris Films explores themes of timeless appeal and reaches beyond parameters of culture, religion and creed. Viewers of Gris Gris Films regardless of their location, language or cultural background share a desire to witness film art that celebrates the courage of the human spirit. 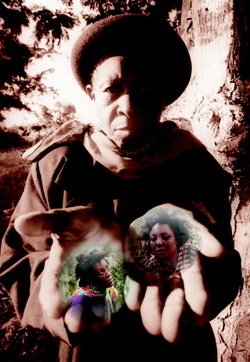 MAANGAMIZI – THE ANCIENT ONE tells the story of three women; a doctor, her patient and the ancient and mysterious ancestor who brings them together. It is a tale of healing through love, compassion and forgiveness. It is the spiritual journey of the soul. It is a story that seeks to reclaim the connection between Africa and her Diaspora. It is a story that dares to represent the histories of two continents as it peels away layers upon layers of pain and ultimately brings healing of the soul. An official selection at over fifty film festivals worldwide, Maangamizi - The Ancient One has won numerous awards including first prize at the Zanzibar International Film Festival and the Paul Robeson Award at the Newark Black Film Festival. The film was submitted as Tanzania's first ever Foreign Film and was an Official Selection at the 74th Academy Awards.